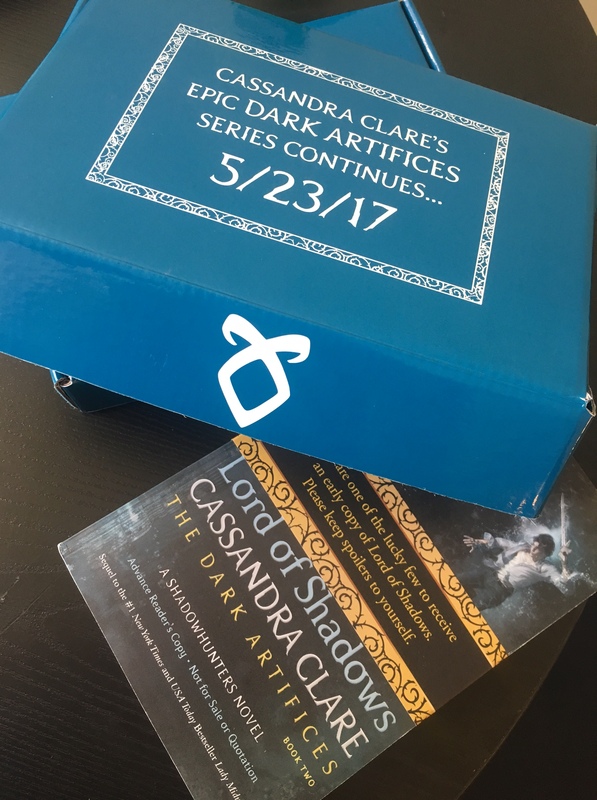 Cassandra Clare’s Lord of Shadows is going to be published in fifteen days – who’s ready? – but a few lucky reviewers and librarians do not have to wait that long because of ARCs (Advanced Reader’s Copies) or galleys. These incredibly lucky fans are getting this lovely blue box and a very special letter by Kelly Link, World Fantasy Award winner and shortlisted for the Pulitzer Prize for Literature (for Get In Trouble), and one of Cassie’s good friends. Cassie has kindly shared Kelly’s letter with us and we hope you you will enjoy reading it as much as we did. You hold in your hands the thirteenth book set in the world of Cassandra Clare’s Shadowhunters. The events that take place in the Shadowhunter series span almost 500 years, but out here in the real world, it’s been just about fifteen years since Cassie began writing about Clary, Jace, Simon, Magnus, and everyone else. And that means that I’ve known Cassie just a little longer than that. I’m writing this letter, because by now, surely, you know what to expect from a Cassandra Clare novel. There will be epic romance, crackling dialogue, plenty of humor, heroism, and just the right amount of pain to split your heart right open. When I asked to write this letter, I knew I didn’t want to spoil any of the book for you. Instead it seemed as if it might be of interest to readers to know something about Cassie’s life as a working writer. I know her daily writing routine pretty well, because it’s also my routine. Cassandra Clare lives in Amherst, Massachusetts. I live one town over. We meet up, along with the writer Holly Black, every day of the workweek at coffeehouses, or in Cassie’s house, and we sit down together to work at the same table or in the same room. We’ve done this for almost a decade now. What’s changed? Well, from the very start, I knew that Cassie was something extraordinary as a writer – and now a lot more readers know that too. What else has changed? Cassie and Holly and I have all written a lot more books. Also, Cassie occasionally acquires a new Scottish fold kitten, which really wreaks havoc with the work schedule. When we meet for work, generally we spend some time discussing the current projects we’re each working on, or sometimes a specific piece of narrative (a particular scene, or a character, or a plot twist or piece of world-building that isn’t yet what we want it to be). If one of us asks for feedback, we throw out bad ideas to each other as suggestions. And yes, I do mean bad ideas. We say to each other, “Well, here’s a terrible idea, but what if you did X?” We give suggestions this way because we’ve found that terrible ideas live right next door to really awesome ideas. Other people’s interestingly terrible suggestions inevitably leave the writer space to improve upon them. We read each others’ work in progress and tell each other when, as readers, we wanted to see more or less; when we anticipated too quickly the turn that a story was taking. We talk about good books that we’ve been reading, bad books that we’ve been reading, what kinds of story shapes we’re currently finding most enjoyable as readers, and we attempt to map out new possibilities that genres like fantasy and young adult offer us as writers. I can tell you that Cassie is scarily good at helping other writers figure out how the emotional arc of any relationship (love story, family story, friend story) can be most satisfying. She’s better read than anyone I’ve ever met (although it might be a tossup if you factor in her husband Josh, who is also better read than anyone I’ve ever met.) Cassie and Holly have also introduced me to some of my favorite people: Sarah Rees Brennan, Maureen Johnson, Robin Wasserman, and Leigh Bardugo. Writers of all stripes come to Amherst, or meet up with Cassie in other parts of the world (Mexico, France, Italy, Ireland) in order to sit down, catch up on each others’ lives, and get as much writing done as possible. There is an idea that writers do their best work in solitude. Friend, I’m here to tell you that whatever method allows you to write the book that you needed to write is the best method. For almost a decade and a half, I’ve been not only writing my own short stories, I’ve been reading Cassie’s work (from first chapter of each first draft, to last sentence of the final manuscript). It’s an inspiration to me as a writer to see how hard Cassie works, and to see the amount of care and attention she pays to even the smallest details of world-building and characterization. I’ve seen how much she cares about her audience, and making sure that her readers see their own experiences reflected in her work. There’s no one like her in the genres of fantasy or young adult. But I hope that you already knew that. I hope that you love Lord of Shadows as much as I love it, and when you’re done, please think of me because very soon now I’ll be getting a first look at The Queen of Air and Darkness as Cassie finishes up The Dark Artifices. I can’t tell you much, but I can tell you this – it’s going to be spectacular. Lord of Shadows is published on May 23. Oh I do love her! I picture them all sitting at the table together and it just makes me beam. How wonderful to have such a great supportive group of women. ❤ Can't wait for LoS AND QoAaD. It's going to be a VERY long wait for that one!